Life Park Project is a CSR joint project by Samsung Life and Life Insurance Social Contribution which is organized by Global Peace Foundation (GPF). It aims to make the Rusun (low-cost apartment) community healthier and happier by providing a multipurpose court and play ground. In addition to the facility, it also provides some programs such as futsal class, taekwondo, English, drawing, educative communal screening, etc. In running the activities, we collaborate with the local government and engage youth volunteers from various universities in Greater Jakarta who are passionate in bringing the community a better life. 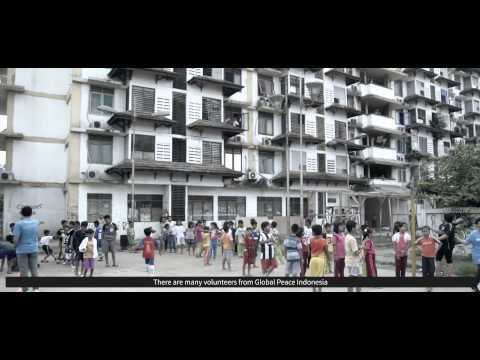 Hundreds of people in Indonesia’s greater Jakarta community have contributed to establishing a healthy, educational and fun environment for the whole family in a large low-cost apartment complex housing thousands of residents. Taking place at Rusun Flamboyan, established since 1998, has 642 households with total residents of 3,154, the project built some facilities including multipurpose court, playground for kids, toilet, and solar-powered light. In addition, the residents also get a sustainable and integrated educational and sport program. In our work, we involve volunteers who are passionate in community development and willing to devote their time and energy to support the Rusun’s children and community development. Before the facilities’ inaugural, 29 November 2014, we have started some activities such as drawing class for kids, English class for school children, taekwondo and futsal for teens, as well as aerobic class for mothers. The project has brought significant impacts into the community. The people become more aware toward the importance of living harmoniously with others and healthy lifestyle. To get involved, please drop us a message through the contact section. Currently, we are preparing for season 2 of the project. We highly encourage other organizations and companies to collaborate to make a better life in this Rusun. We also provide an opportunity for youths in the city to engage with the community through volunteering activities.